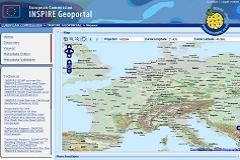 The INSPIRE Geoportal is the unique access point to global European Environment Geoinformation resources shared and made available by all member states within the framework of the "Infrastructure for Spatial Information in the European Community" (INSPIRE) Directive. During the INSPIRE Conference 2013 Planetek Italia has been assigned the AWARD for Academic Excellence and Innovation in INSPIRE related to the Small & Medium Enterprises (SME’s) for the innovative activities in the field of INSPIRE and SDI development. Planetek Italia has been awarded the tender for the "Development of the technical components of the INSPIRE Geoportal at European Level", of the Joint Research Centre (JRC) - Institute for Environment and Sustainability. The new INSPIRE Geoportal, the central portal for environmental information in the European Union, will upgrade the present version made up by JRC. The main objective of this project is to provide the operational version of the INSPIRE Geoportal at European level, including integration interfaces for discovery and view services from member state portals and thus to foster the harmonization of member states' national Geoportals implementations through the adoption of open standards and open source products. The project, realized in 18 months, adopts the Design Thinking paradigm, the working philosophy which leads Planetek Italia in its activities. Download the Press Release: "The European INSPIRE Geoportal awarded to Planetek Italia"